After seven long years, Nintendo's most famous bounty hunter finally returned in Metroid Prime. This game took the traditional 2D side-on view of previous Metroid games and dragged it kicking and screaming into the 3D world. Sporting amazing graphics, a musical score to kill for and some of the most intense and involving gameplay on the GameCube, Metroid Prime was an instant classic and is still loved by gamers everywhere. At first, Prime was supposed to be for the N64, but progress was delayed due to the fact that there "weren't any concrete ideas" for it. It ended up being held over to GCN, where it was made into a collaboration project between Nintendo and Retro Studios. Their main focus was on Prime, but this led to the cancellation of 4 other games (one being Raven Blade). 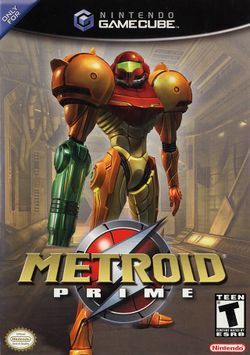 Kenji Yamamoto and Kouichi Kyuma composed music for Prime, using remixes of Metroid games to "satisfy old Metroid fans". For example, Lower Norfair was used for Magmoor Caverns and the Brinstar theme was used for Tallon Overworld. This page was last edited on 19 December 2016, at 19:20. This page has been accessed 65,865 times.